Lady Talks a Lot: Seeing Halloween threw children’s eyes. It has been an interesting journey being taken back to being a child by my children. Halloween is much more fun when you are a young child. We have been talking about going out for the last week; our son wants every night to be Halloween. Our daughter has been practicing her “Trick or Treat” technique. She takes any bag she can find and fallows me around the house saying, “Trick or Treat” and holds the bag up expecting me to put candy into it. She is only two, has got the idea and is trying to milk it for all it is worth. I have to laugh each time she does it, but I am also quick to explain that it is not Halloween yet. For the first time we are in a house and can actually get into decorating for Halloween. We went shopping with our kids and picked up some small Halloween decorations for the house. All our windows have those plastic cling pictures. We made bats, spiders and pumpkins out of craft paper and they are all over our walls. For the first time we made a real jack-o-lantern. Every year before we would just colour the pumpkin. This year we coloured the pumpkin for a week and then today we carved it. It was a great fun. I don’t remember ever making a jack-o-lantern when I was a kid. My kids kept talking about it, so we decided it was time to make one. Our son was excited about it until he realised he had to put his hand into the pumpkin, and get pumpkin guts on his hands. 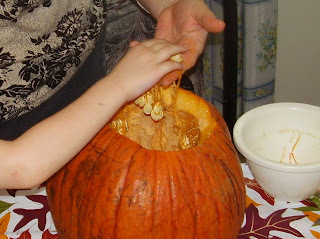 Our daughter was in there pulling as many pumpkin guts out as she could with her little hands and then had to wash them and back to the pumpkin again. Once we got our son to try and clean the pumpkin he was ok. Fun was had by all. 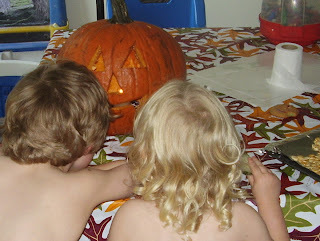 Both kids watched in fascination as Daddy cut a face into the pumpkin and Mom took the seeds out of the pumpkin guts. We toasted the seeds, but the only one who will eat them is our son. We put a candle into the jack-o-lantern and our kids started asking if it was a birthday and tried to blow the candle out. They had to put their faces right up to the nose of the jack-o-lantern and blow. They could not blow it out, but they sure tried. It was funny to watch. Once it got dark we put the jack-o-lantern in our living room and turned out the lights. All of a sudden the jack-o-lantern went from fun to wow for the kids. The kids have known what they want to go out as on Halloween for the last month. Our son will be a knight, and our daughter wants to be a dragon but we do have a few other costumes just in case she does the same thing as she did last year. She was already to be a dragon right up to the point of putting on the costume just before going trick or treating. She ended up as Pikachu because it was the only other costume we had that fit her. I am not sure if it is more fun to be a kid at Halloween or a parent. It has been a lot of fun seeing how much the kids are getting into the holiday. They are so excited; I hope it does not rain. We are dressing them warm, taking the bus to the street we have always gone to. It is only one little street but every one on the street participates in Halloween. All the houses are decorated and the people love to see little kids dressed up. For the last two years people went out and bought little pumpkins for our son because he loves them. The first year he did Halloween he kept trying to take every ones pumpkins, so they remembered and had little ones for him to put in his bag. It is a little out of our way now that we have moved but I would not even think of not going to this street for Halloween. I hope every one out there gets as much fun and joy out of Halloween as our kids and we are.